Anyway…back to business. My school is making department-wide changes next year, and one of the changes is adopting Proficiency Based Grading categories. I’m excited about trying something new and I’m excited that my department is excited about trying something new! This seems to be the trend in language teaching and we’re jumping on the train (the bullet train, if you will!). 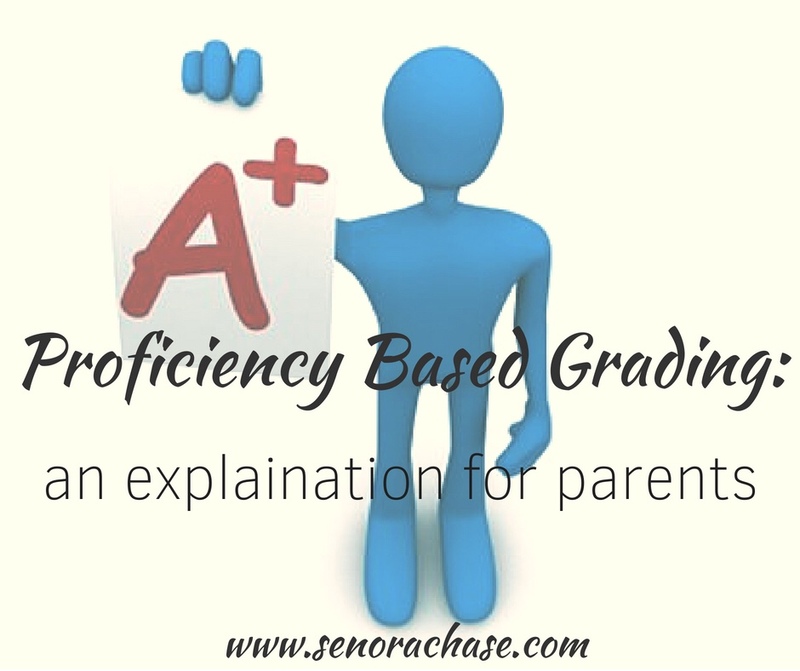 If you’re looking for more details about assigning grades based on proficiency, here are a few articles for your summer reading pleasure: Martina Bex explains the reasons she loves Standard Based Grading, Scott Benedict discusses how to make grades meaningful. In a nutshell, it’s evaluating their reading, writing, listening and speaking skills, so their grade reflects what they can do in the language. If I were The Boss Of The World, I would do away with grades all together. I would load my little darlings up with comprehensible input, marvel at how much they’re acquiring and call it a day, without worrying about assignments and assessments and report cards…but my school and my district and my state expect me to assign a letter grade so… that’s what I’ll do. Since Proficiency Based Grading will be a major shift, here’s a parent letter that I wrote explaining the changes and how our “new” categories will be weighted. Feel free to “make a copy” so that you can adapt away! As a department, we debated, negotiated and finally agreed on our category weights. The input skills reading and listening are weighted more heavily in the lower levels, and as students progress through our program, the weights even out in level 4 and AP. Our department is mixed, that is to say that not everyone has embraced CI (yet!) and one of the compromises we reached was a category called “practice” to record homework, participation and the other assignments that non CI teachers love. I’m not sure how I’ll use it, and it’s weighted more heavily that I’d like (10%!) but that’s how compromise works and until I’m recognized as The Boss Of The World, I’ll be a team player and make it work. Stay tuned for updates as the semester unfolds. One other note: our school also requires a category labeled “Final Exam”, so we’ll just go with that. We figured at 20% it would be easy to include all the skills and assign 5% to each. We’ll see how it works! What changes do you have up your sleeves for next year? After I get back from Japan, I’m heading to the Comprehensible Cascadia Conference and I’m super excited to learn new stuff! (And hang out with my Alma Gemela, the one, the only Rita Barrett!) Three cheers for Professional Development! Hi! Just curious…what do you do when you give a test that assess reading, listening and speaking? Could that go in the “exam” category? Or, do you take the various parts of the test and grade them separately and put the grade in the corresponding category? Right now my department grades based on tests, quizzes, participation and projects. I would love to try something out more proficiency based but I know I would need to come to a compromise with my department and I would have to do something with quizzes/tests.